Milwaukee women's leadership group Professional Dimensions on Wednesday elected its board of directors for the 2018-'19 year, ushering in the most racially diverse board in the organization’s history. Overall, 33 percent of the group's board positions will be held by women of color, according to a news release. Founded in 1978, Professional Dimensions' membership comprises 350 women throughout southeastern Wisconsin. “Diversity has always been one of our core tenets," said newly elected president Emily Phillips in a statement. "We believe it is our duty to use our power, as a leading women’s organization, to further advance our community by shining a light on women of color and ensuring our leadership is representative." 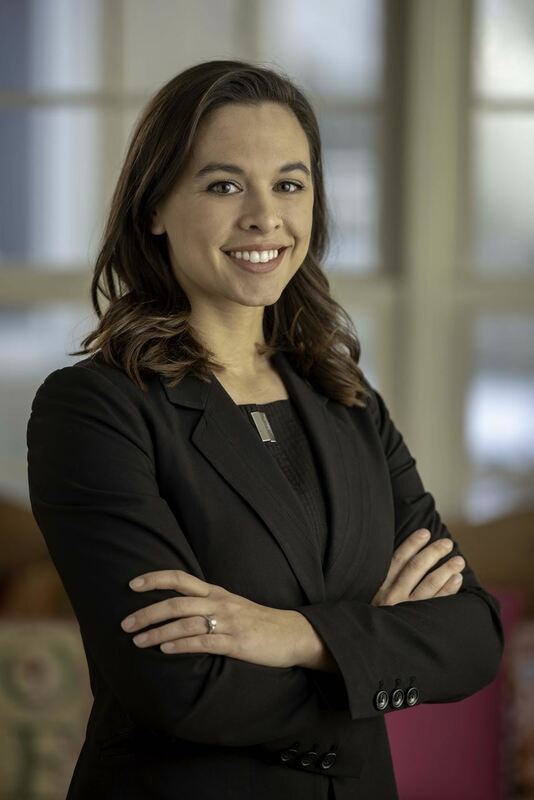 President: Emily Phillips, Robert W. Baird & Co. Inc.
MILWAUKEE, Mar. 8, 2018- Nearly 600 people marked International Women’s Day Thursday night by celebrating two trailblazing women at the Pfister Hotel in downtown Milwaukee. Professional Dimensions, a membership organization of inclusive women leaders who use their power to help each other and advance the community, presented the 2018 Sacagawea Awards to Dr. Eve Hall, President and CEO of the Milwaukee Urban League and Paula Penebaker, President and CEO of YWCA of Southeastern Wisconsin. Hall and Penebaker were selected for their career accomplishments, commitment to community and support of the advancement of women. In addition to honoring Milwaukee’s trailblazing women, proceeds from the 2018 Sacagawea Awards Dinner will increase the impact that Professional Dimensions’ Charitable Fund will have on their 2017-2019 project with Pathfinders’ New Paths Program. Dr. Hall and Ms. Penebaker were presented with custom art pieces created by artist Kristin Thielking, Professor of Sculpture and Glass at the University of Wisconsin, Stevens Point. Thielking created three unique pieces of art for the event, one for each winner, and one that will reside in the Professional Dimensions Sacagawea collection at Alverno College. Milwaukee area trailblazers to be acknowledged for their professional achievements and community contributions. MILWAUKEE, Dec. 14- Professional Dimensions, a professional women’s organization serving the Greater Milwaukee area since 1978, has announced the selection of its 2018 Sacagawea Award winners as well as the 2018 Sacagawea artist, whose work will honor the award recipients. 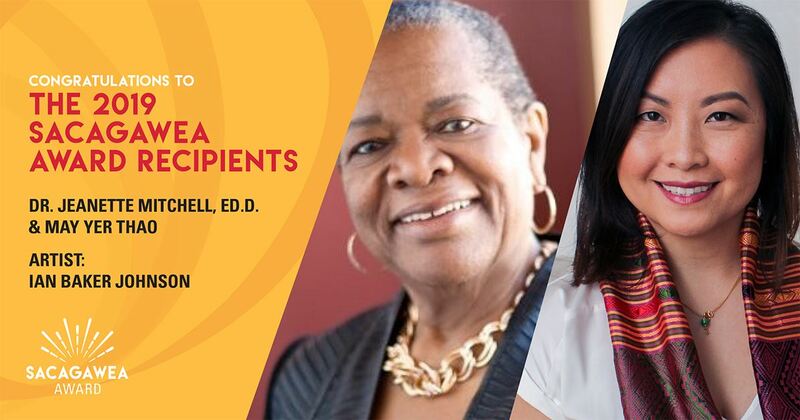 The 2018 Sacagawea Award recipients are Dr. Eve Hall, President and CEO of the Milwaukee Urban League and Paula Penebaker, President and CEO of YWCA of Southeastern Wisconsin. Both are trailblazing women chosen for their career accomplishments, commitment to community and support of the advancement of women. Dr. Eve Hall, a native of Milwaukee, previously served as President and CEO of the African American Chamber of Commerce of Milwaukee. She has also served as Chief Innovation Officer for the Thurgood Marshall College Fund and has held leadership roles in public affairs, Milwaukee Public Schools and Governor Tommy Thompson’s office. Hall is the co-founder of the African American Women’s Project Fund, which was created and designed to provide funding to organizations supporting the well-being of women and girls. Additional affiliations include Rotary Club of Milwaukee, Delta Sigma Theta Sorority, Inc. and TEMPO Milwaukee. Passionate about education, Hall earned a B.S. degree in educational psychology from Florida A&M University, a M.S. in administrative leadership from the University of Wisconsin-Milwaukee, and a doctorate in educational leadership from Cardinal Stritch University. Penebaker began her tenure at the YWCA as the Chief Human Resources and Facilities Officer in 1999. Previously, Penebaker worked at First Wisconsin Bank, and also spent 13 years at Procter & Gamble in Cincinnati, Ohio. She is a member, and past board director, of Professional Dimensions and was instrumental in the creation of the organization’s signature race and racism programming. Penebaker serves on the board of directors of the Rotary Club of Milwaukee, and is a member of the Milwaukee Alumnae Chapter of Delta Sigma Theta, Inc. and Milwaukee Chapter of The Links Incorporated. She also serves on the board of directors of Milwaukee World Festival, Inc. and is a Trustee for the Public Policy Forum and the Milwaukee County Federated Library System. Penebaker earned a B.S. degree from Edgecliff College, which has since merged with Xavier University. She has received awards from the Milwaukee Business Journal, Community Brainstorming Conference, North Central Service Club, the Medical College of Wisconsin, BizTimes and the Greater Milwaukee Foundation. To honor these exceptional women, Kristin Thielking, the 2018 selected Sacagawea Award artist, will create three unique pieces of art: one piece will be crafted for each winner, and one that will reside in the permanent Sacagawea collection at Alverno College. Thielking is a Professor of Sculpture and Glass at the University of Wisconsin-Stevens Point and has also taught at the Milwaukee Institute of Art and Design, University of Wisconsin-Madison and Penland School of Crafts. After growing up in Long Island, NY, Thielking went on to receive a BA in Fine Art and Comparative Literature from Brown University and an MFA in Sculpture from University of Wisconsin-Madison. Thielking works in a wide range of materials, from paper to glass, bronze and steel. She has a special interest in working with language as a material and creating work that inspires dialogue, and the state of the environment. Professional Dimensions (PD) is a network of diverse Milwaukee area professional women that connects, engages and inspires its members to reach their career and personal goals. Driven by its four tenets of leadership, community, diversity and networking, PD creates opportunities for women to develop their respective work disciplines and networks, expand their personal reach for the good of the community and create an inclusive space for members to flourish. Since its formation in 1978, Professional Dimensions has grown to more than 350 members throughout southeastern Wisconsin. 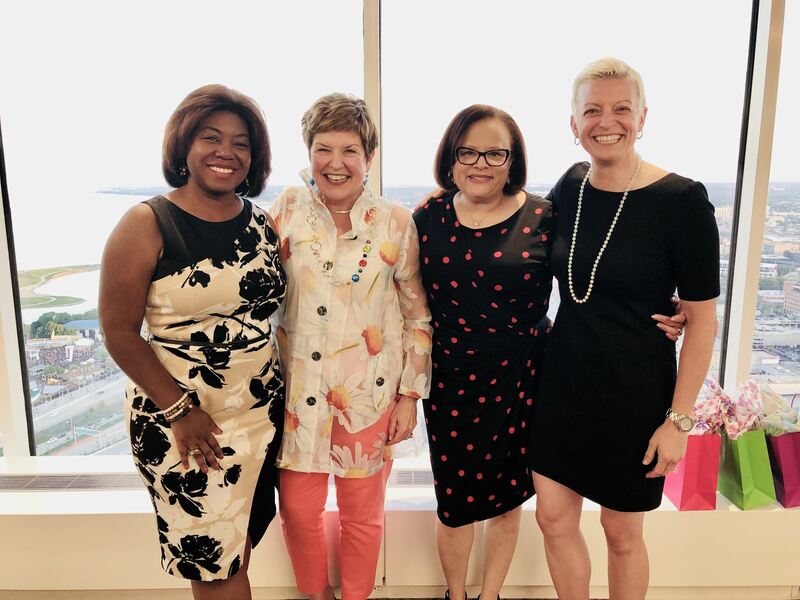 Four high-powered women came together Sept. 28 to talk about their prominent roles in putting together the deal and building the new $524 million Milwaukee Bucks arena in downtown Milwaukee. Check out the attached slideshow put together by Milwaukee Business Journal freelance photographer Kenny Yoo to see photos from the popular event. The event was put on by Milwaukee Women inc, Tempo Milwaukee and Professional Dimensions. The panel consisted of Danielle Bergner, managing partner at Michael Best & Friedrich LLP; Alicia Dupies, vice president of corporate social responsibility at the Milwaukee Bucks; Angie Helfert, project manager at Mortenson Construction; and Catherine Jacobson, president and CEO of Froedtert Health. Melinda Davenport, morning anchor at WISN-TV (Channel 12), was the moderator for the panel. The event featured a discussion about how each of the women developed innovative partnerships to earn support for the new arena and what the new Bucks campus being developed in downtown Milwaukee means for women professionals in southeastern Wisconsin. Bergner said she is hopeful the success of the project will lead to future major developments in Milwaukee. "I'm very proud of what we were able to accomplish on this project," said Bergner, who worked on the many leases and other legal documents necessary for the project to move forward. "I hope people appreciate what it took to get this done. It showed that if government and others work together, we can do a lot in this community." Jacobson said she was very proud of the innovation that was included in the team's $30 million, state-of-the-art practice facility, which recently opened near the new arena site. Froedtert agreed to sponsor the new facility, along with building an adjoining medical clinic. The locker room door even includes a retina scan for players to enter. "There is nothing like this in the NBA," she said. "The whole point is to ensure maximum athletic performance of the players." Bergner said the hope is that the new arena will prompt development projects in city of Milwaukee neighborhoods near downtown. "The real test is what we see in the Bronzeville in five years," she said. Milwaukee-area executives in attendance included Phyllis King of the University of Wisconsin-Milwaukee, Tami Garrison of MillerCoors, Sandy Wysocki of United Performing Arts Fund, Angela Adams from Goodwill Industries of Southeastern Wisconsin, Kelly Skindzelewski of GE Healthcare and Laura Gough of Robert W. Baird & Co. Inc.
“For so many years, we’ve heard well-intentioned folks say, ‘Well, I’d like to have more women on my board, but I just can’t find any,’” said Lindsay, who is founder and chair of the marketing firm Lindsay, Stone & Briggs. That excuse, say Sponem and Lindsay, can – and should – go away. But it likely will take some innovation by existing members of corporate boards for the under-representation of women to fade at a faster pace, said the two chief executives. That most corporate boards lack gender diversity isn’t in question. Females account for about 16% of board members nationally, according to the U.S. Government Accountability Office. That’s up from 8% in 1997, but still a very slow evolution, Lindsay and Sponem say. More-recent data from the executive compensation research firm Equilar showed that as of March this year, 15.9% of Russell 3000 board seats were occupied by women. That was up from 15.1% in all of 2016. While women accounted for nearly one-quarter of new directorships in the quarter, the Equilar data showed about 22.5% of boards in the Russell 3000 – an index including the 3,000 largest companies traded in the U.S. – had no women at all.